June in Istria- a day so hot, I can't even think. One of those incandescent days that make any usual task a struggle, when all you can think of is how to cool down. It's the first day of its kind this year, and I guess we should be celebrating the beginning of summer with a cool drink on the terrace (and maybe we'll do that later this evening), but my mind has been set on a particular October day in Assisi for a couple of days now, recollecting my impressions of the town to pour them into a travel story. Furthermore, I have been working on the photos from Assisi for days, it would be only right to share them (and soon). 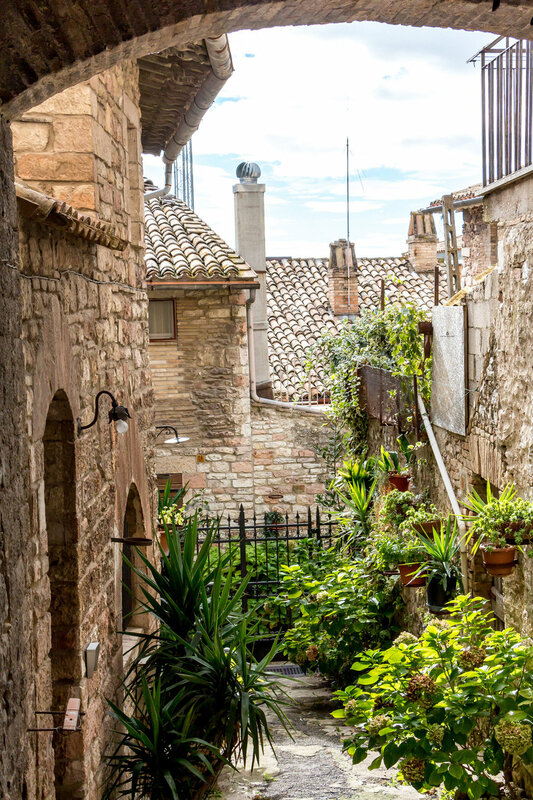 Before coming to Assisi, our Umbrian road trip took us to Cortona (in Tuscany), Lake Trasimeno and Perugia. We have wandered around hilltop and lake towns, tasted delicious food and experienced some true Italian dolce far niente. 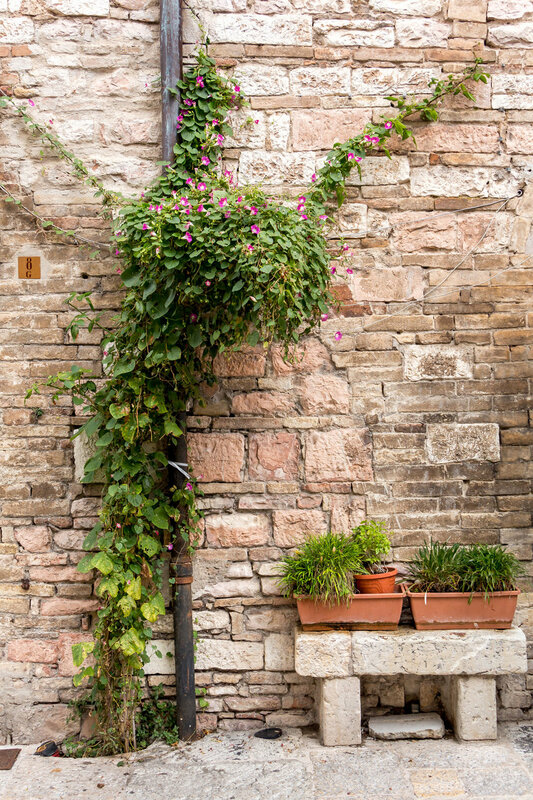 With Assisi, everything was about art and architecture; with Assisi, it wasn't dolce far niente- we walked, and walked, and walked, soaking in the medieval bell towers, flying buttresses, Giotto's frescoes, green courtyards and endless staircases. Assisi was on my endless list of Italian towns I wanted to visit ever since I learned about Unesco World Heritage Basilica of San Francesco and other Franciscan sites in my medieval studies, and then about the earthquake of 1997 and the renovation of the demolished church in my conservation studies. Assisi is the birthplace of St Francis, the founder of the Franciscan order, Poor Clares order, and patron saint of Italy (and of ecology!). I remember one interesting lecture on the story of St Francis- he was a rich merchant's son that used to indulge in music, feasts, fine clothes, and allegedly used to spend money lavishly. An anecdote tells about St Francis's encounter with a beggar in which he gave him all the money he had with himself. Then, he went to war, was captivated and spent a year in prison- during that year began his spiritual conversion. He started living a life of a penitent, a beggar, and a preacher which made his father forcing him to renounce his heritage. He spent his life catering to the poor and the ill, preaching poverty, peace and love to all human beings as well as nature. After his death in 1226, Pope Gregory IX canonized St Francis and laid the foundation for the Basilica of St Francis, the church we know today. The church consists of two parts- the Upper and the Lower Basilica, later one being used as a crypt. And while the Lower Basilica was built in Romanesque style, the Upper was built in Gothic style and finished with a simple Renaissance portal. Once we got up to the town and entered the basilica, we got to see fresco cycles from Giotto, Cimabue, Simone Martini and Pietro Lorenzetti (among others!) in the Lower basilica, and a beautiful fresco cycle "the legend of St Francis" in the Upper Basilica. There has been a more than a hundred years old dispute in the attribution of the cycle, originally attributed to the great Florentine painter and architect Giotto di Bondone, but whether the cycle is painted by Giotto or some other artist, the beauty is still the same. We sat in the middle of the nave, observing scene by scene, trying to decipher the events painted, soaking in the simplicity and the colors of the paintings. There have been a couple of moments in my life where I was left speechless, moved, enlightened by the art in front of me: when I first saw Bernini's square in front of St Peter's Basilica in Vatican, Caravaggio's paintings in San Luigi dei Francesi in Rome, Giotto's fresco cycle in Capella Scrovegni in Padua, and the interior of Upper and Lower Basilicas in Assisi. 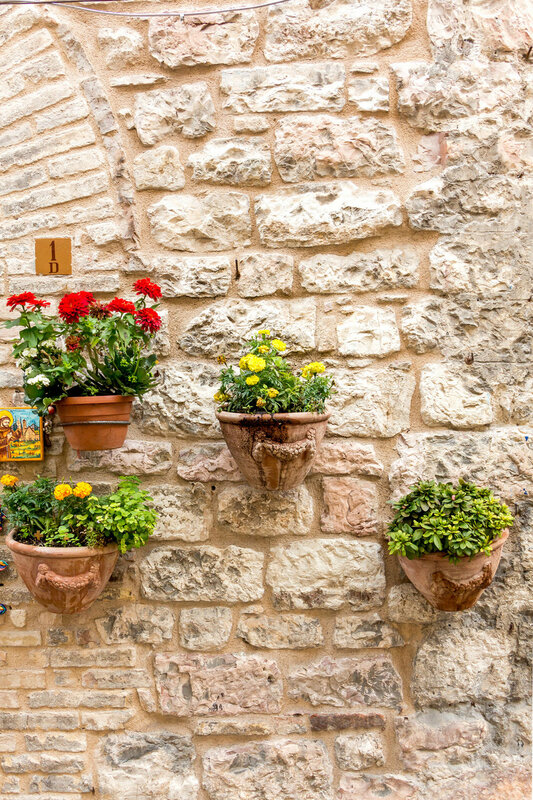 In Assisi, there is beauty everywhere you look: in its numerous churches, stone paved streets, stone houses with lanterns hanging above the doors, flower pots hanged on the facades (I have never seen so many flower pots! ), flowery, green courtyards surprising you now and then. We climbed up the hill to the Rocca Maggiore, a medieval fortress overlooking the town and the valley. 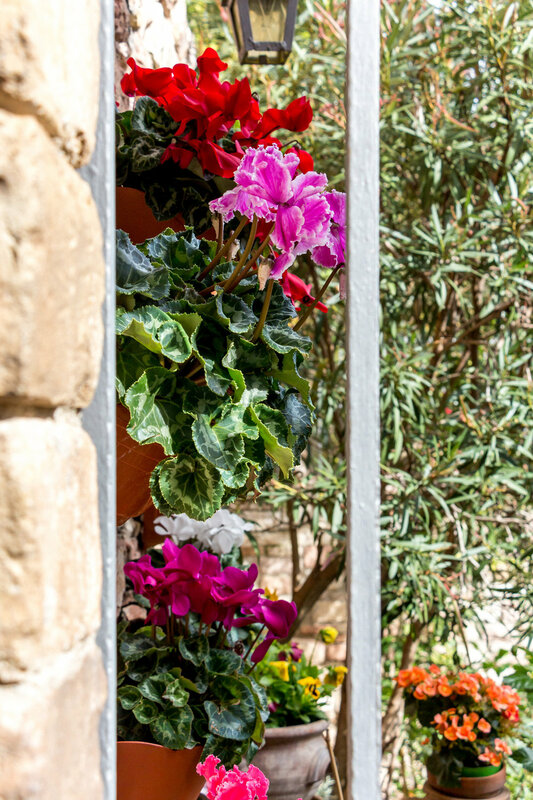 That is the view you wouldn't want to miss if you ever find yourself in Assisi: agricultural plain on one side, undulating hills and mountains on the other, and the town nestled on a slope, among pine trees and cypresses. From up above, you notice that the town is almost monochrome, if it wasn't for the greenery. Its simple beige stone houses and rooftops with medieval structures of Cattedrale di San Rufino and Basilica di Santa Chiara almost give it a look of a model or picture book town. In Assisi, we didn't give as much importance as we usually give to food, but we did enjoy a long pause for tea in a bar called Caffe Pasticceria (therefore, pretty hard to find on the Internet). Despite its unoriginal name, the interior with vaulted ceiling, the long showcase with countless cakes, meringues and torrone, very good tea and the fact that we were almost alone there made it very appealing to us. So much, that we went there twice in one day. For lunch, we wanted something quick and light- a small, family-run Piadina Biologica was just that. This place was obviously popular, as we barely found a table, squeezed in between a loud local family and a couple of happy tourists. Piadina is thin Italian flatbread, filled with cheese, fresh or grilled vegetables, cured meat etc. If I remember correctly, I think I had one with scamorza cheese, radicchio, walnuts and honey, and it was delicious. If you ever find yourself in need of a quick lunch in Assisi, this is a very good place. After two nights near Assisi, our last stop was Todi, another hilltop town, another place where we indulged in local cuisine and the landscapes so much that we still talk about it. I can't wait to share it here finally! If you want to save this article for later, I made another Pinterestable image below. :) Thank you!